I GET A PHONE CALL FROM A MOBILE PHONE WHICH IS ALWAYS HARD TO UNDERSTAND THE PERSON BECAUSE IT IS NOT A VERY CLEAR SIGNAL. 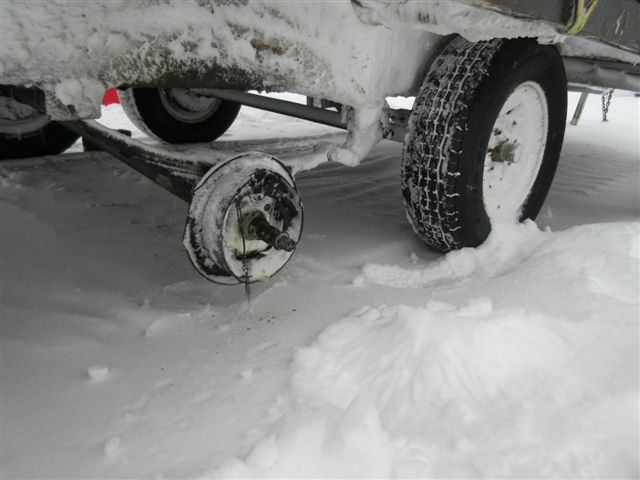 THE BEST I COULD FIGURE OUT, IT IS A GROUP OF CARIBOU HUNTERS THAT HAVE LOST THE WHEEL-HUB ON THE TRAILER. 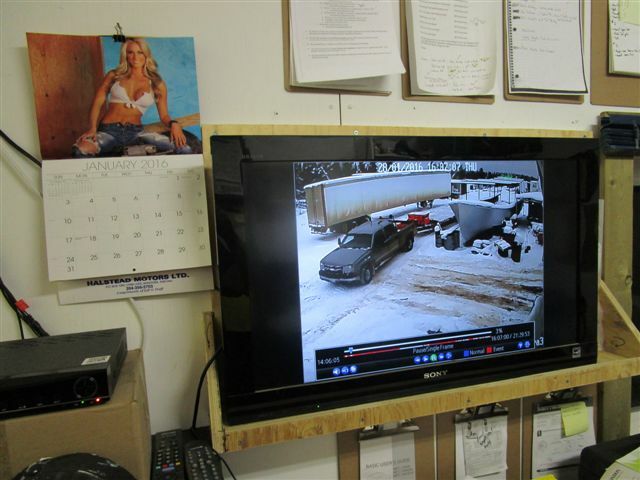 NO PROBLEM BECAUSE THIS IS NORMAL FOR SOUTHERN TRAILERS TRAVELING THE WINTER ROAD. IT WILL TAKE A COUPLE OF HOURS TO GET EVERYTHING PACKED UP PLUS THIS IS THIRD WHEEL-HUB IN 4 MOTHS THAT I HAVE REPAIRED SO I'M RUNNING LOW ON PARTS. FIRST THING I HAVE TO DO IS GET THE NEW TANDEM TRAILER READY FOR THE TRIP INCASE I CAN'T PERFORM MAGIC TO GET THE WHEEL-HUB REPAIRED. 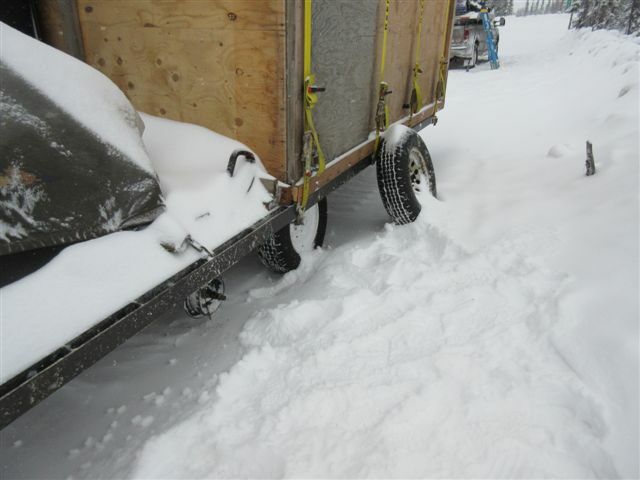 THEN THE BROKEN TRAILER GETS LOADED ON MY NEW TRAILER FOR THE TRIP OFF THE WINTER ROAD. ONE OF THE PROBLEMS I'M HAVING WITH THE NEW TRAILER IS THE SOUTHERN "BUBBLE" TIRES. 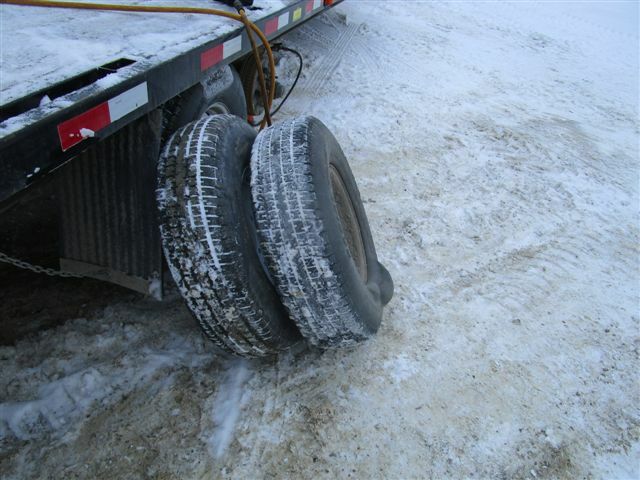 YES THESE ARE HEAVY DUTY TRAILER TIRES IN THE SOUTH BUT UP HERE IN THE GREAT WHITE NORTH THEY GET BUBBLES ON THE SIDE WALLS. THIS IS VERY DANGEROUS AND WHEN THE BUBBLES POP THEY CAN REALLY HURT BECAUSE I HAVE HAD THIS HAPPEN IN THE PAST. 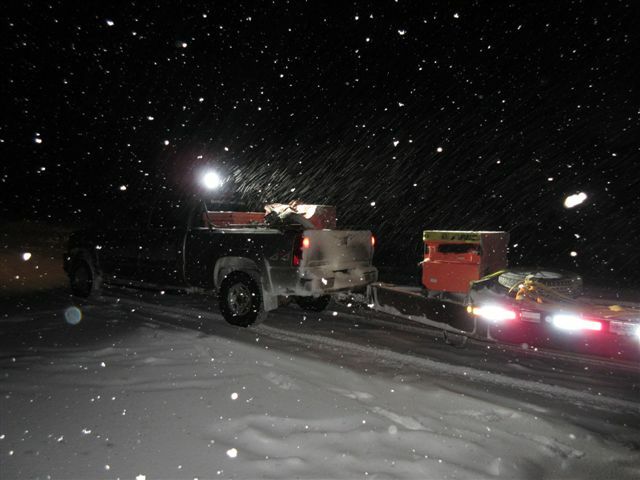 WITH THE NEW TRAILER AND PINK CREW CAB LOADED UP, I HEAD OUT AT MIDNIGHT TO TRAVEL THROUGH THE SNOW. IT WAS GREAT FUN BECAUSE THE SNOW WAS GETTING DEEPER AND DEEPER THE FARTHER I TRAVELLED. AT 7am IN THE MORNING I HAD TO SLEEP BECAUSE I HAD WORKED ALL DAY THEN TRAVELLED ALL NIGHT. AFTER A LITTLE 1.5 HOUR NAP I WAS READY TO GO AGAIN. THAT IS ABOUT ALL YOU CAN SLEEP IN THE PINK CREW CAB BEFORE THE CRAMPS GET TOO BAD. 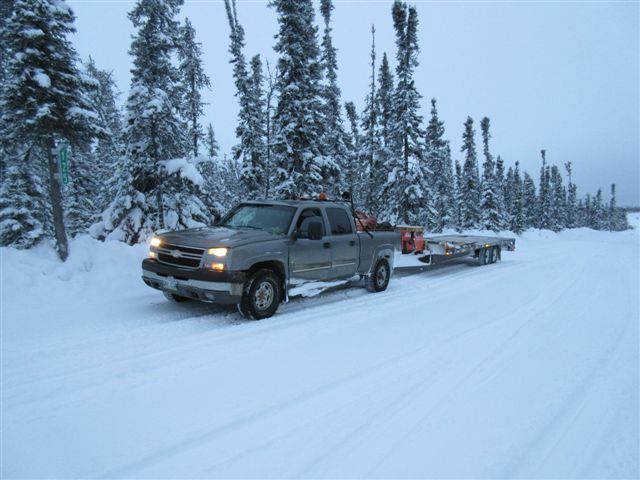 AT 10:30 am I ARRIVED AT THE CAMP OF THE CARIBOU HUNTERS. THE MISSING WHEEL IS HOW I KNEW I WAS AT THE RIGHT CAMP. 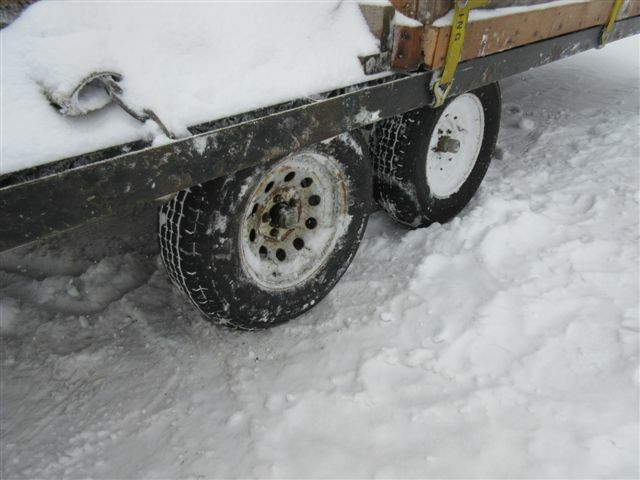 THE HUNTERS WERE ABLE TO FIND THE MISSING WHEEL AFTER IT HAD FALLEN OFF BEFORE THE DEEP SNOW HAD CAME. THE DAMAGE IS NOT TOO BAD TO THE AXLE SPINDLE AND I WAS ABLE TO PREFORM A LITTLE MAGIC TO GET THE REPLACMENT WHEE- HUB BACK TOGETHER. I BROUGHT UP LOTS OF PARTS AND IT MADE THE JOB LOOK EASY PLUS WE CHECKED ALL THE OTHER WHEEL HUBS TOO. WITH THE WHEEL-HUB FIXED CORRECTLY, THESE HUNTERS CAN CONTINUE TO HUNT FOR THE NEXT 3 DAYS. IF I COULD NOT HAVE FIXED THE WHEEL-HUB THEN THE HUNTING TRIP WAS OVER. 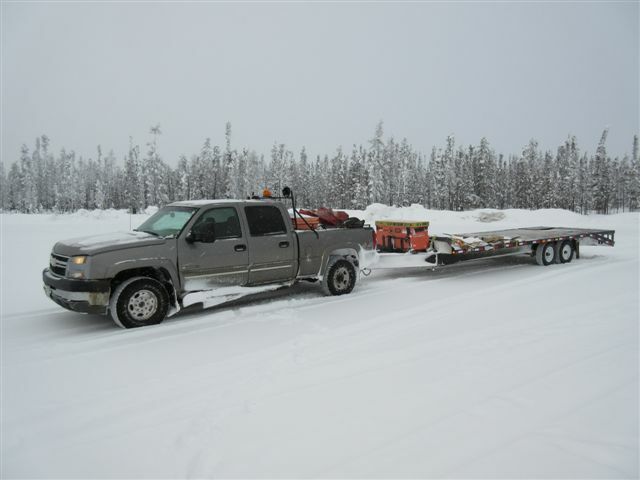 I WOULD HAVE WINCHED THE BROKEN TRAILER UP ON TO MY NEW TANDEM TRAILER AND BRING IT BACK TO THE "KINGDOM" FOR REPAIRS. THERE WOULD BE A 3 DAY WAIT FOR PARTS DUE TO THE BREAKAGE HAPPENING ON A WEEKEND. 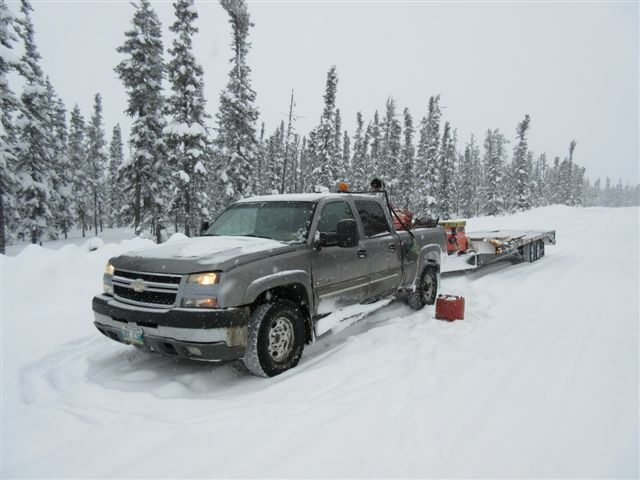 NOW I HEAD SOUTH OVER THE WINTER ROAD AND STOP TO FUEL UP WITH JERRY CANS BECAUSE THERE IS NO GAS STATION FOR THE NEXT 200kms. 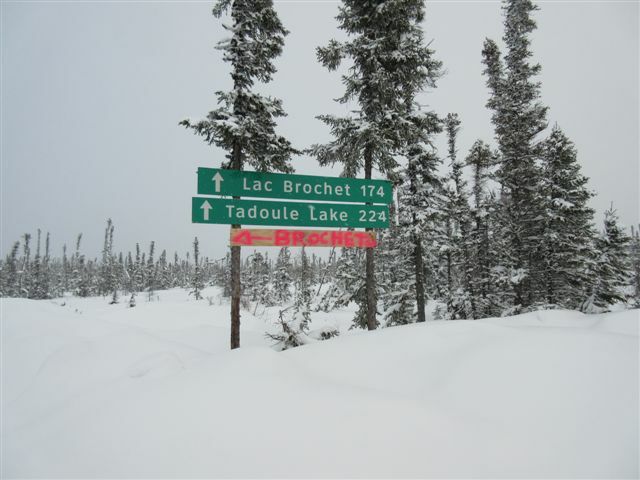 I STOP AT THE BROCHET JUNCTION TO MAKE SOMETHING TO EAT AND I HAD TO TAKE A PICTURE OF THE NEW SIGN. THE OLD SIGN MUST BE IN SOMEONE'S "MAN CAVE" AS A COLLECTORS ITEM.